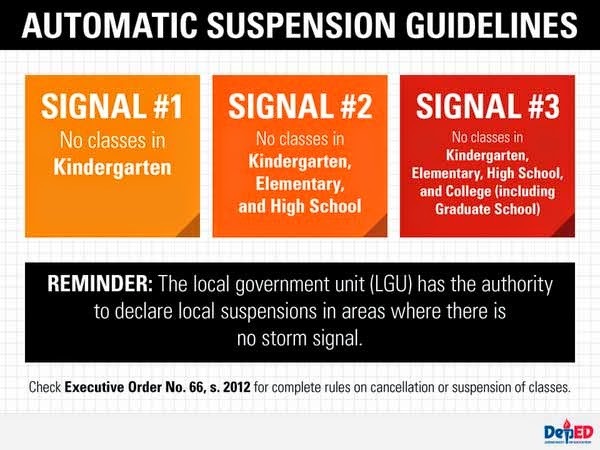 Suspension of classes on Tuesday, July 22, 2014, has been declared in several areas affected by the Typhoon Henry-enhanced Habagat. As of 4 a.m., state weather bureau PAGASA said the eye of Typhoon Henry was spotted at 280 kilometers Northeast of Aparri, Cagayan or 240 km Southeast of Basco, Batanes with maximum sustained winds of 130 kilometers per hour near the center and gustiness of up to 160 kph. Public storm warning signal number 2 (wnds of 61-100 kph is expected in at least 24 hrs) has been raised in Batanes Group of Islands, while signal number 1 (winds of 30-60 kph is expected in at least 36 hours) is up over Cagayan including Babuyan and Calayan Group of Islands. Meanwhile, the National Disaster Risk Reduction Management Council (NDRRMC) is on blue alert status as said tropical cyclone is still in the Philippine Area of Responsibility, Presidential Spokesperson Edwin Lacierda said Monday. Under the blue alert status, half of the personnel of all regional and municipal disaster risk reduction management offices, regional civil defense offices, and other concerned government agencies in would-be affected areas should be at their posts to monitor the situation, the government website PCOO.gov.ph explained. Lacierda said the Philippine Atmospheric, Geophysical and Astronomical Services Administration (PAGASA) is continuously monitoring the situation and disseminating weather bulletins and flood advisories, while the Department of Social Works and Development’s (DSWD) Municipal Disaster Response teams and Social Welfare Assistance and Municipal Development teams are on alert to be readily available for duty. He noted that a P2,754,274 fund has been set aside and a total of 5,715 family food packs have been readied for distribution to evacuation centers. The Department of Public Works and Highways (DPWH), he said, is ready to clear roads in landslide- and flood-prone areas while the Department of Interior and Local Government (DILG) has instructed its regional offices to roll out the pre-disaster risk assessment meetings, and advise governors to participate in such meetings. The Philippine Coast Guard meanwhile has issued warnings to fisher folks to refrain from venturing into the sea, Lacierda said, adding that military and navy units in Tacloban are standing by for possible rescue operations.